This is my favorite time of year and I am starting the holiday baking ideas early this year. 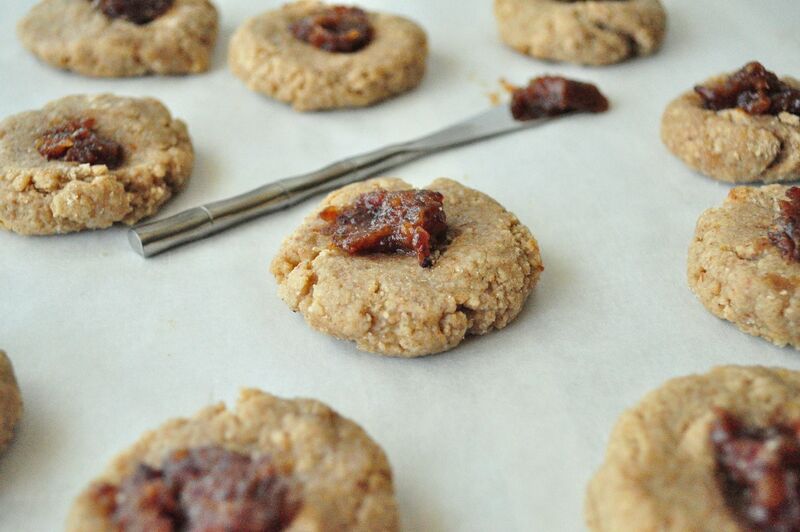 These Apple Butter Thumbprint Cookies are perfect for Fall. All you need is 3 simple ingredients. ZERO refined sugar, no grains, gluten, or oil. Make them up in under 15 minutes. For more yummy holiday cookie ideas, check out this post. This recipe could not be more simple. 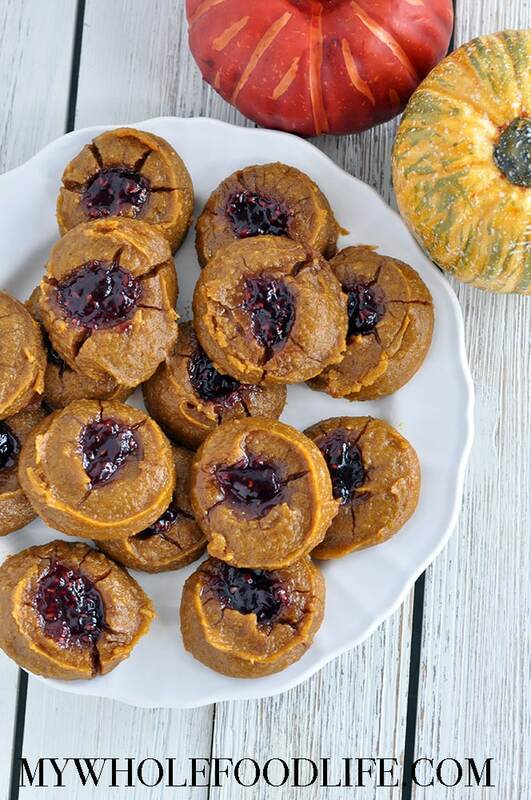 It’s vegan, gluten free and even paleo approved! If you don’t want to use apple butter, any jam will do. I have been on a major hazelnut kick lately. 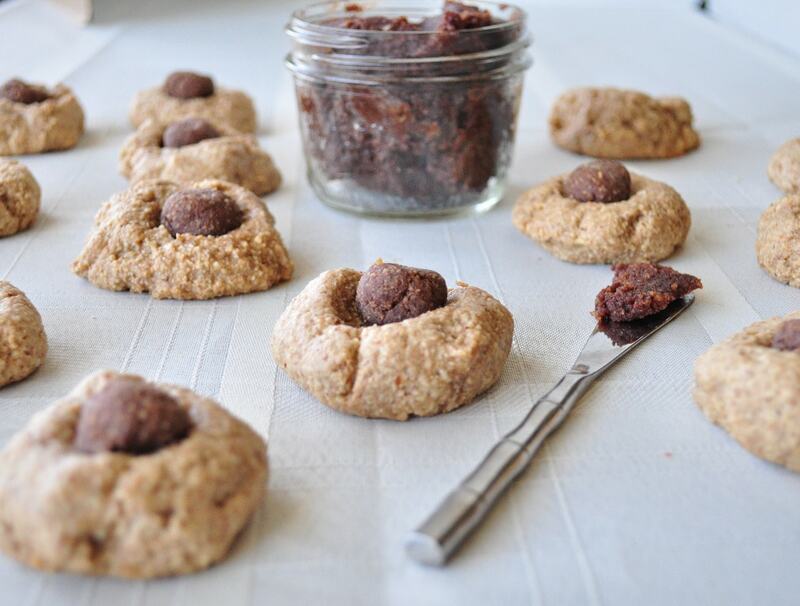 First I made my No Bake Vegan Nutella Bites, then it was my Vegan Nutella Granola and now these yummy homemade nutella thumbprint cookies. Next, I think I might try some hazelnut milk. 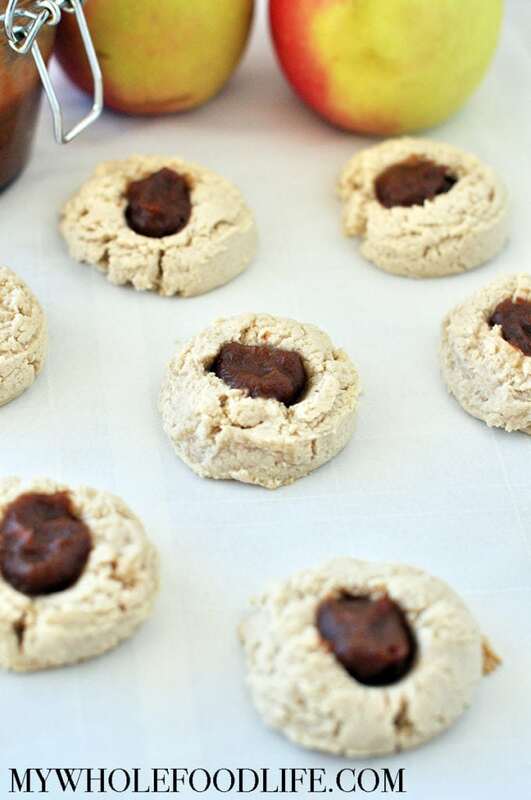 I filled these cookies using my Homemade Vegan Nutella. I love thumbprint cookies. You can really go in some many directions. In the blender or food processor grind the almonds and oats after measuring. When they are the consistency of flour, add them to a bowl with the rest of the dry ingredients. Add the wet ingredients into another bowl . Add wet to dry and stir until everything is combined. Roll dough into balls and place on the baking sheet . Once all the balls are rolled, flatten each one with your palm. Use your thumb to make an indent into the cookie. This is a job I let my three year old do. Fill each hole with the homemade nutella or whatever other filling you desire. Bake for about 13 minutes. Enjoy!